Trendy onesie for your new little man! Pair with buffalo print leggings, hat and moccs for the sweetest look! 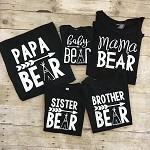 Be sure to get yourself the Mama Bear sweatshirt to match you little bear!